The starting point was Stuart McIver’s 1997 history for the City’s 50th birthday, updated by Cynthia Thuma’s 2005 pictorial history, and was further encouraged by Cindy’s unpublished 2008 update to McIver’s book. The new book breaks new ground, uncovers new facts, reveals local characters, puts Wilton Manors in national, and international perspectives, debunks established myths, interviews heretofore unheard from sources and, in a scholarly way, has a good time. Wilton Manors is a gem which has been surrounded by the occasional flashy object. Huge enterprises north and south crashed in flames in the teens and 1920’s. The carefully thought out, elegant Wilton Manors failed to launch, but Ned Willingham made good on all his debts. He left us with the gracefully curved Wilton Boulevard (now Wilton Drive). He also left us with memories of the Abreu Towers at Five Points, the grand entrance to Wilton Boulevard and a pretty good palette from which to paint a future. Pitchforks and Torches have come out a number of times in Wilton Manors History. Citizens are interested, they are involved, and they will not be railroaded. The latest example is the new City Hall, which has amazing parallels with the construction of its predecessor. 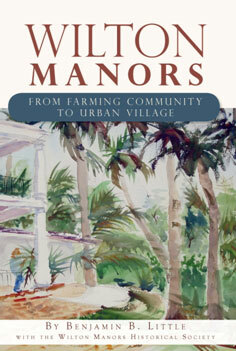 Read all about it in Wilton Manors: From Farming Community to Urban Village. 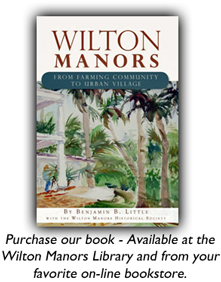 It is available to purchase at the Wilton Manors Library and various retail establishments in Wilton Manors. It is also available from “big box” book retailers and on the internet. The material on this site is made available solely for research, teaching and private study. All images and written content should be considered ©Wilton Manors Historical Society or another entity. Any duplication, publication or other re-use requires permission and appropriate attribution. To contact us about re-using our material click here. The Historical Society is an IRS 501(c)(3) approved tax exempt not-for-profit corporation.